Newly elected MLCs take oath. Newly elected members of the Legislative Council including TRS, MIM and Teacher's constituency were administered oath by Deputy Chairman of Council N Vidyasagar Rao on Monday. 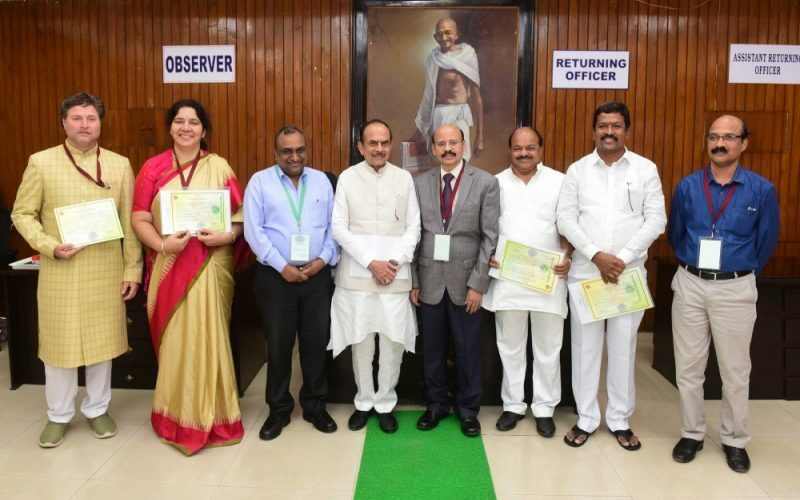 The MLCs who took oath at the Council building including Home Minister Md Mahmood Ali, Sheri Subhash Reddy, Satyavathi Rathod, Y Mallesham, MIM member Mirza Hasan Affendi. The two Teachers MLCs A Narsi Reddy and K Raghotham Reddy. Eminent leaders like TRS working president K T Rama Rao, Former minister T Harish Rao, Legislative Affairs Minister V Prashanth Reddy, Ministers E Dayakar Rao, Ch Malla Reddy, Telangana Legislature Secretary V Narasimha Charyulu and others were also present.